Smaller than mallard, extremely cute in appearance. This one had 4 or 5 young, half her size, and was aggressive towards mallards. I have not found another image that shows the white eyeline behind the eye and around the eye. Is that a juvenile marking, is this a hybrid? 160 I believe this to be a female Mandarin Duck. It's hard to tell from this picture if there's a small blue/green flash next to the white on its side. The white rear eyeline certainly matches as do many of the variancies in shades of brown. And smaller than a Mallard. Hope this helps. 44 I agree with Karmann65. 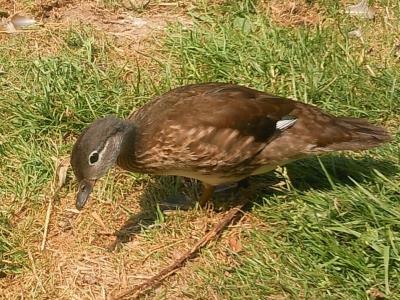 It is a female Mandarin.